Recycling the beauty of our forest's trees. Peter Kinsella is a man of many and varied professions. Following high school graduation, he was inducted into the Royal Canadian Mounted Police as the youngest member to date. After five years of service, he joined General Motors Acceptance Corporation as a field representative and was posted to Gander, Newfoundland where he was introduced to the profession of Air Traffic control. In 1980 after fourteen years of controlling, he went to Dalhousie University followed by the Technical University of Nova Scotia and obtained a degree in Industrial Engineering. In 1984 Peter moved to the Saint John area to work on the Canadian Patrol Frigate Program. Peter began turning just over two years ago and immediately became passionate about the art. Peter states that “knots and holes” hold a special attraction to him as each piece is unique with its own beauty just waiting to be discovered. 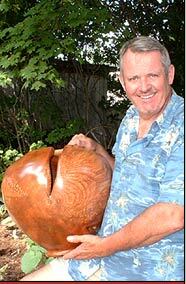 He now specializes in turning large vessels or sculpture. Turnings with Character can be seen at many stores throughout Atlantic Canada. Find a store near you. Or contact Peter to purchase a wood turning.